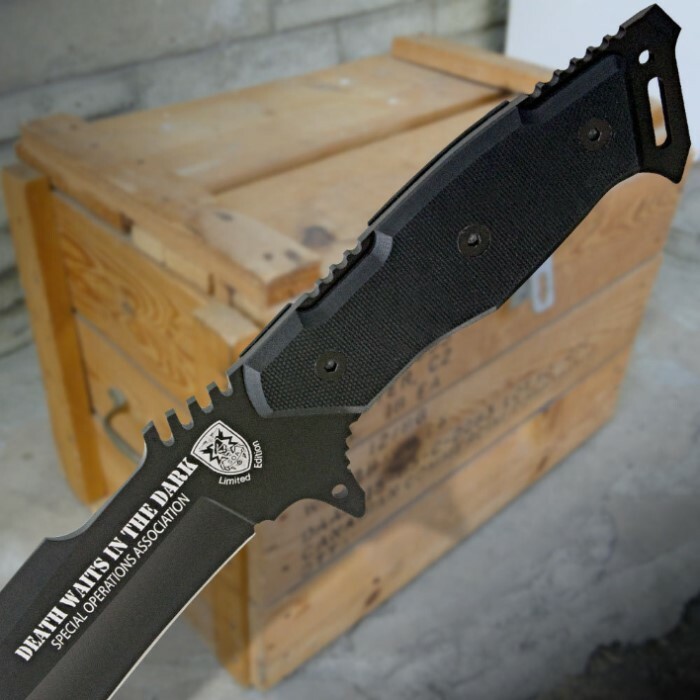 United Cutlery Death Waits in the Dark Knife | BUDK.com - Knives & Swords At The Lowest Prices! Enemies of the free world have found that Death Waits In The Dark when the Special Operations soldiers come knocking. United Cutlery has now designed a limited edition S.O.A. knife after the slogan. Got this in around 3 days ago, and now am just getting time to write a revue on it. I'll just get to the point. Fast shipping, that's always good, no problems with the knife so far, the knife is the same as shown on its display picture. Razor sharp, tested with paper and last nights steak and potato meal. Quite nicely sized and its sheath is only composed of a lope to strap onto your belt. If your seeking a good self defense knife, you wont find better for the price, Unless your seeking something smaller. I love this knife its perfect i have only had to sharpen it once since i got it and i use it on a daily basis. it cuts almost everything like butter. Although i really don't like the nylon sheath that it comes with due to the fact that it falls apart to easily. I recently got this knife as a christmas present from my aunt and its amazing EXTREMELY sharp straight out of the box. This is a great knife. If you want a good reliable knife i suggest this one. This knife is amazing!! I had to get two of them. The edge is sharp and the grip is comfortable (for my hands). The blade is a full tang and balanced. The sheath has lots of play and the knive doesn't stay secure without using the strap to bind the grip securely. Overall a great knife to get! I love this knife, when i saw it, i didnt take more then a couple seconds to decide i was buying it. ive had this knife since early this year, ive never once had to sharpen it. i use it on a daily basis, this knife is the pinacle of bad a**. i recomend this knife to anyone who loves having the best blades.im not going to tell you to buy it, im telling you to look at the slogan and tell me that doesnt say buy me in itself. Amazing KNIFE, when I first saw it, I bought it. Spent less then a couple seconds deciding whether I should or shouldn't, razor sharp out of the box, its been almost a year, use it on a daily basis, still does not need to be sharpened. I recommend this knife to everyone who is looking for a solid blade that screams excellence. Just got mine in the mail. Great shipping as usual. Took 3 days. Came in EXTREMELY sharp and fits very snug in the sheath. Overall great buy for the price. This combat knife is really great. When I got it, it came already sharp. Plus cant beat that price..